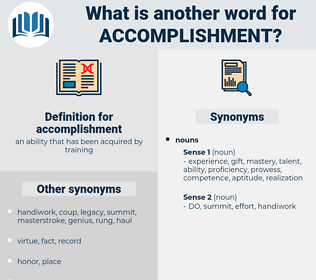 What is another word for accomplishment? 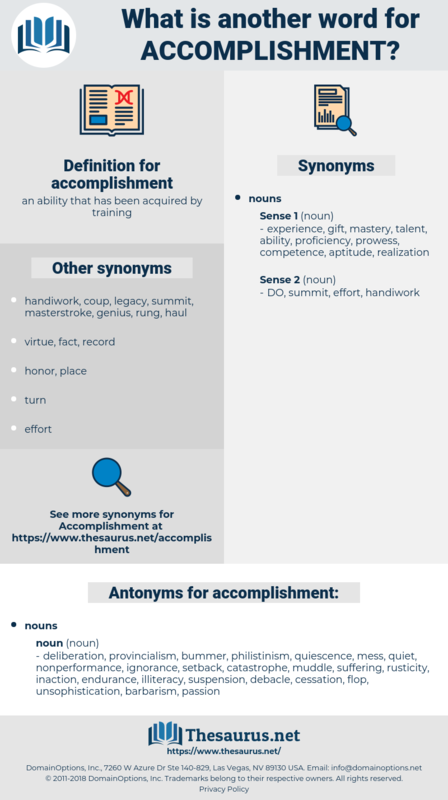 milestone, result, results, advancement, Deliverable, Accomplishing, Achieving, creation, acquis, Envisaged, investigation, realizable, score, exercise, impairment, triumph, encroachment. developments, completion, realization, fulfilment, performance. feat, pursuit, completion, self-cultivation, talent, satisfaction, pursuance, accompli, compliance, discharge, materialization, fullness, furtherance, perpetration, Attaining, realization, fulfilment, observance, culmination, enjoyment, infringement, actualization, cultivation, embodiment, completeness, appreciation, development, fruition, affront, merit, performance, operationalization. deliberation, provincialism, bummer, philistinism, quiescence, mess, quiet, nonperformance, ignorance, setback, catastrophe, muddle, suffering, rusticity, inaction, endurance, illiteracy, suspension, debacle, cessation, flop, unsophistication, barbarism, passion, boorishness, letdown, vulgarity, Nonfulfillment, fiasco, immobility, parochialism, bust, dud, coarseness, disaster, disappointment, naught, inertia, shambles, inactivity, crudeness, rest, washout, Clownishness, botch. 2. Had this been their great object, they took the best and speediest plan for its accomplishment. I haven't a single talent, hardly an accomplishment. performance, effort, narrow escape, cakewalk, face saver, face saving, arrival, reaching, smooth, walk, enlisting, attainment, haymaking, credit, recruitment, masterpiece, squeak, record, pass, track record, close shave, foothold, liberation, release, close call, squeaker, masterstroke, fait accompli, freeing, feat, exploit, beachhead, base on balls, accomplished fact, going, sledding.